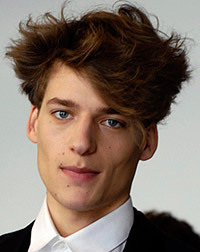 Niels Raabe was born in Hamburg, Germany, in 1988, is a German male model. Niels was discovered at Central Station in Berlin, by model scout from modeling agency M4 Models. Interview Magazine The History of Man, V Man, Feld Hommes by Thomas Lohr, GQ Italia Flexible Men, Esquire UK Coming Up, L'Officiel Hommes Boxes: A Tribute to Will McBride. Country Road by Daniel Jackson, 7 For All Mankind, Ungaro Spring 2012 by Raphael Bruggey and Hugo Boss. Walked runway in New York, Paris, Tokyo and Milan. Represented by agencies DNA Models New York, New Madison Paris, 2pm Model Management Copenhagen, Sight Management Studio Barcelona, FM Agency London, m4 models Hamburg. I never thought about modeling as a profession, but somehow it seems to me to be good. I liked it fashion shows, especially in Tokyo and NY. For men, there are few superstars like Heidi Klum and Kate Moss. It's easier for us to come to good campaigns. In the end, it's just only about the look and just happens to be "in" or not.